'Be My Eyes,' a new crowd-sourced app, has capitalized on the iPhone’s video call function to allow the blind to get instant help from sighted people in challenging situations. In the first days since its launch, nearly 30,000 people have joined. Since the app was launched on Thursday, it has assisted people over 2,600 people on more than 5,400 occasions, according to the Be My Eyes website. This number keeps growing as the number of volunteers willing to “lend” their eyes continues to expand. Over 30,000 sighted people had joined the app at the time of publication. All sighted helpers are taking part in the project as volunteers. Be My Eyes - helping blind see from Be My Eyes on Vimeo. 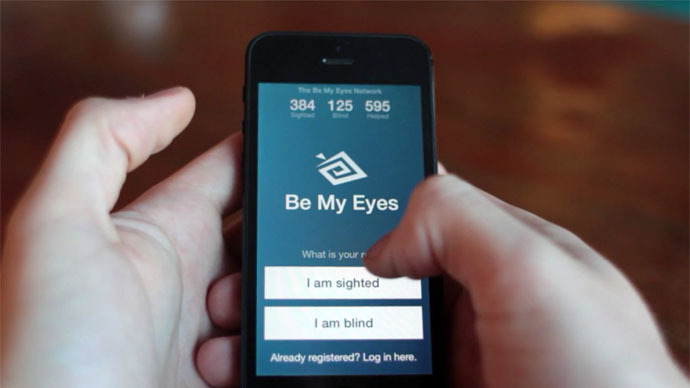 The idea for Be My Eyes was first presented at a startup event in Denmark in 2012; it took nearly two years to develop. Checking the expiration date on a product, making it to the other side of the street at an unequipped crossing, and other routine things often became unsolvable tasks for the visually impaired. But the application – developed by Denmark-based company Thermodo – has provided a simple, effective solution to such problems. When a blind person finds himself in a challenging situation, he can activate Be My Eyes to launch a video chat with a sighted helper. The person in need can point his phone's camera at the problem, and the assistant can explain how to cope with it. Sighted assistants are encouraged to take a more active participation in the project via points assigned for each act of kindness and a “level up” system.